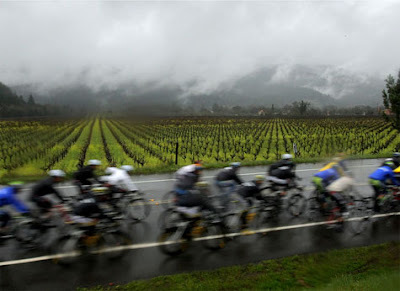 The peloton rides under heavy skies as they pass through wine country in Napa County during Stage 1 of the AMGEN Tour of California on February 15, 2009 from Davis to Santa Rosa, California. The worst part was the disposal. And there never seemed to be a proper place to dump the solvents, or those plastics, I mean films. And some of those great camera men, of course, could always get at least one good shot. Thanks for posting my mealy (sp?...lol) comments.